This is a handy little tool to break and rejoin most types of chains quickly and easily. Suitable for most sizes of drive or cam chain from 35 to 630. The kit is supplied with 4 pins ranging from 2.2mm to 3.8mm, press plates, anvils and a high quality chain press. This kit will pay for itself. The amount of money you pay at the garage will come to the cost of the whole kit so why not buy the whole kit and have the use of it again and again. NOTE: This tool may be used for breaking all sizes chain from number 35 to 630 but is not recommended for cutting heavy-duty type of 530 or 630 chain unless rivet head is ground off first. NOTE: If working on cam chain be sure and cover chain tunnel with rag to prevent parts dropping down. 2 - Select correct size tip for chain to be worked on and insert into tool alignment bolt. Remove push bolt, insert pin, with spring under head of pin, and replace push bolt. If small 2.2 mm tip is used you must also use the upper and lower guides to prevent breaking tip. Upper guide threads on to alignment bolt, lower guide drops in place in bottom of tool body. Smallest pin (2.2 mm) should be used on most cam chain. 2.9mm pin used on #25 or #35 chain 3.8 mm pin for most motorcycle drive chain (428 to 530). 3 - Put tool over chain, tool tip must be withdrawn at least 2 mm into alignment bolt. End of chain rivet should be held into position in tool alignment bolt, other end of rivet in hole in tool body. Tighten alignment bolt securely against chain. 4 - Tighten push bolt with 14 mm wrench or lever until chain pin is pushed completely out, chain pin will drop out hole in bottom of tool. 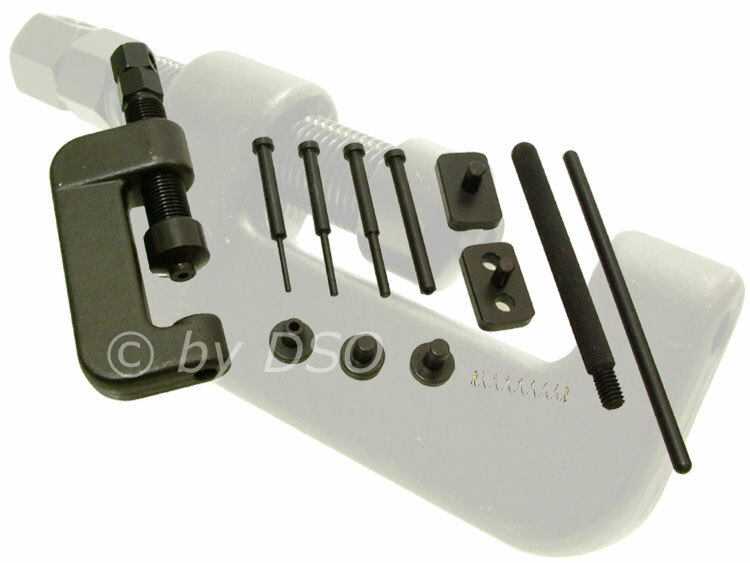 Withdraw push bolt and pin, loosen alignment bolt and remove tool. You may want to push both pins out. NOTE - When tightening push bolt against chain link pin if you don't 'feel the tip going down smoothly, check that tip is correctly lined up against link pin. If not redo step 3 or you may break pin. 1 - Rivet tip and anvil must be in place in tool. 2 - Assemble chain with link to be riveted, special rivet link pins must be used, using original pushed out pin is not recommended. Do not attempt to use clip type connecting link. Pin must be all the way through chain link, it can be tightened into place by placing chain into tool with tool tip withdrawn and tightening alignment bolt. 3 - Position tool over pin to be riveted, make sure tool tip is withdrawn and tighten alignment tool securely against chain. Tighten push bolt very tight so that rivet tip spreads chain pin. End of chain link pin should be flared so that pin is solidly held in place. Repeat procedure on other link pin. 4 - Withdraw tool, remove chain, visually check that both chain link pins show same spread end marks and that riveted on side plate is in alignment with side.